Virgin Galactic is a company owned and established by Richard Branson's Virgin Group to undertake the challenge of making private space travel available to everyone and bycreating the world's first commercial spaceline. 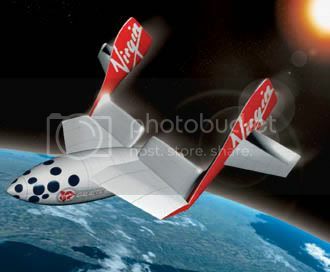 Virgin will own and operate privately built spaceships, based on the history making SpaceShipOne . These spaceships, which are currently under construction, will allow affordable private sub-orbital space travel for the first time in history and give you the opportunity of being amongst the very first private astronauts. Ay, this will give the Greenies a brutal round of cognitive dissonance. 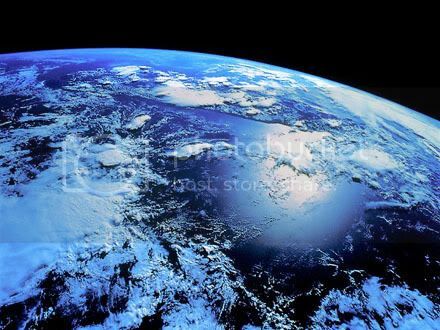 They love the Earth Mother and would be positively orgasmic with the chance to see the Earth from afar -- but getting there is a bit of an energy whore, a massive, useless, self-indulgent smudge on the very Earth Mother they're all paying $200,000 to go see. That $200,000 would go a long way in Dafur. It would install photovoltaics on a lot of houses. It would put stilts on a lot of houses in the Seychelles, which are supposedly at risk of raising seas. But Virgin's Richard Branson is confident he'll find a uh, shipload, of self-centered souls who will buy a ticket. Yeah, but would a true Greenie ever consider such a thing? Yeah, you bet! The opponent of one of our projects is a Greenie par excellence, who has used global warming arguments (among hundreds of others) against our project. He's also a techno-geek and recently paid thousands of dollars to experience zero gravity in a dropping airplane. He's not a Green with Green; he's just green DINK (dual income, no kids), so we probably won't see him going into space, but we will see many with fervent Greenism belief systems throwing all those beliefs away for a massive carbon smudge and temporary rush. And they won't even have to go to confession in the morning.